Keep tightly closed. Oxidized and inactivated by moist air within a few days. Some isomerization in light. Store at 2-8°C. IATA: Hazard Class: 6.1; UN Number: UN2811; Packing Group: II; Shipping Name: Toxic solid, organic, n.o.s. Applications: An inactive secosteroid. Functions as a prehormone. 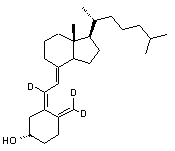 Converted to its active form by two hydroxylations to form calcitriol. Used as a nutritional supplement. May be used as a poison bait for rodents. It has also been found to have antiproliferative and antimetastatic effects on breast, colon, and prostate cancer cells.d antimetastatic effects on breast, colon, and prostate cancer cells.